In the spring of 1985 the University of the Pacific hosted a major conference, called to celebrate John Muir's life and legacy. It also toasted the John Muir Papers Microform Project, which [at the time was] nearing completion after a five-year effort to gather, organize, and publish all of Muir's extant journals, correspondence and holograph manuscripts. Over 250 registrants from all parts of the West gathered to hear twenty-five speakers and panelists from thirteen different academic institutions in nine different states and the District of Columbia. Collectively the papers presented at the conference's eight academic sessions represent the cutting edge of Muir's scholarship in America today. 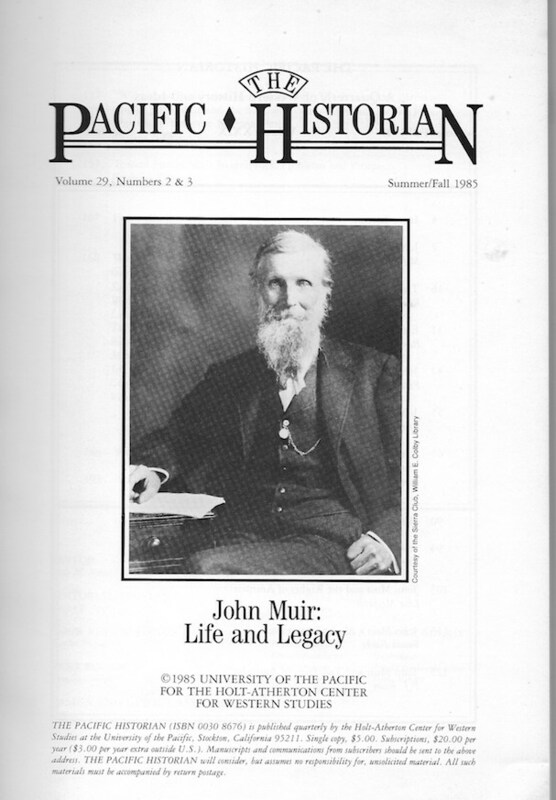 Many of them broke new ground in Muir historiography by utilizing scholarly resources in the Muir-Hanna family collection at the University of the Pacific that had not been accessible before. Recognizing their importance, The Pacific Historian has selected twelve of the most important for publication in this special double issue. - Excerpted from the Introduction.